Welcome to Frontline Fire Protection! Since 1993, we have established ourselves as a leading provider of fire sprinkler services throughout West Central Florida. We hope you enjoy your visit. Take a look around. We've tried to make this site informative, and have included information about what we do, and how we do it. That way, when you have a situation that requires a fire protection specialists' attention, you'll feel confident in calling on us for help. 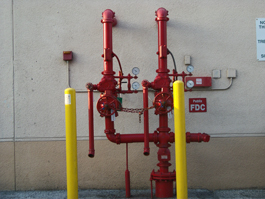 Fire sprinkler systems, fire pumps, etc. Leak repairs, Inspection Violation, etc. NFPA-25 inspections & Fire Marshal issues. As a Tampa Bay Area fire sprinkler specialist, Frontline Fire Protection Inc takes pride in being a customer-friendly and responsive fire sprinkler company that builds long-term relationships with our clients. We understand the critical role that fire sprinkler systems play in the life safety of your building, and by working closely with General Contractors, Architects, Developers and Owners, we strive to provide the best fire sprinkler systems and service available in our industry. Frontline Fire Protection Inc is a fire sprinkler company in the Tampa Bay area that can handle all aspects of your fire sprinkler needs from the design and planning stage, through the fabrication and installation process and finally to the inspection and maintenance of your system. In addition, because of our many years of quality, professional experience we can quickly and accurately assess your needs or diagnose problems. This makes it possible for us to provide you with a realistic, fair and free estimate before any work is begun. Industry statistics indicate that installing a smoke alarm in your home cuts your chance of perishing in a fire by 50%. 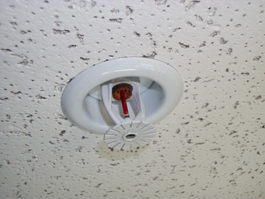 Installing a residential fire sprinkler system increases your survival rate to 97%. Fire Sprinkler Violation? 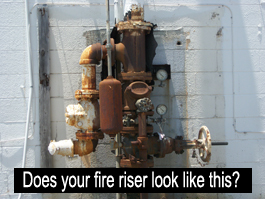 Call us today to help clear Fire Department Inspection problems.